Materials – I’m not sure if it is 100% cotton fabric and 100% cotton thread… I bought a lot of scrap fabric from the end of the bolt scrap bins from the big box fabric store. I also bought cheap thread on sale. I do not even know the company’s name because the label came off. I believe this is a Thimbleberries pattern that I picked up in one of their books. I’ve wanted to quilt for a long time and I have 2-3 very old quilt books (10+ years) that I obtained somewhere. I actually forgot about them. But after I started the hand quilt project I didn’t want to start a new project because I wanted to finish it first. But it took forever and I didn’t want to spend money at the LQS because it was beyond my budget at that time. I just wanted to practice and learn something but not spend a whole lot of money to do it. 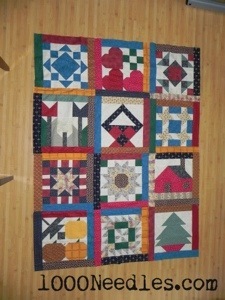 I was new to quilting and up to that point all I had done was hand quilting. While I enjoyed the ease of taking projects with me to be done by hand wherever I found myself stuck at, I wasn’t ready to spend more money on a new craft. So I happened to be at my book shelf looking for a good old book to read when I found these quilt books tucked away with other crafting books that I would rather not mention. ;0 I opened them up and one detailed how to quilt. 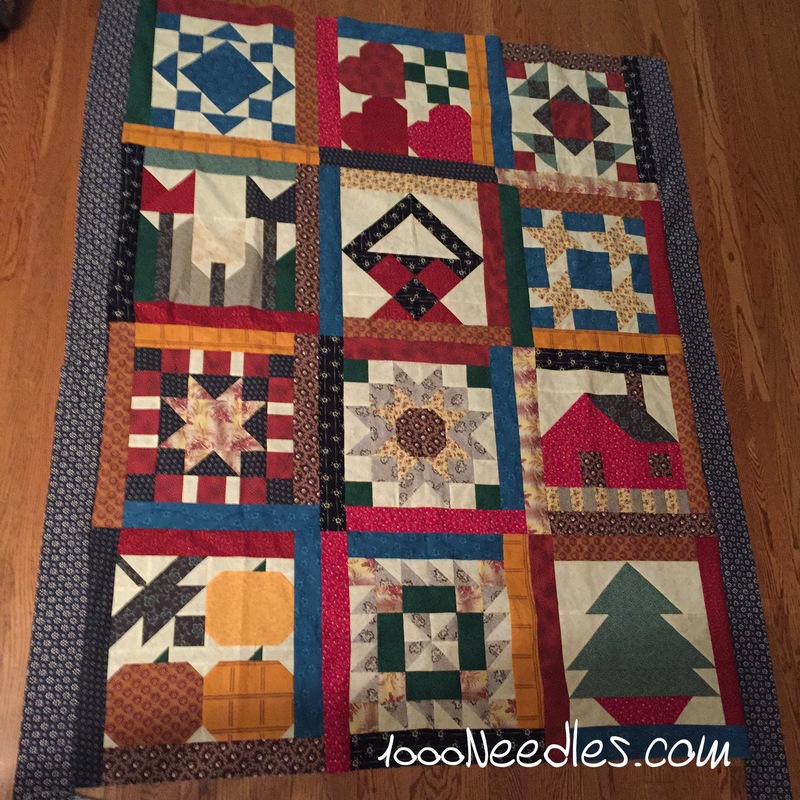 Some of the information repeated what I learned when I took the hand quilting class but then there was information on how to machine piece and quilt which I had no idea how to do. So I read through the book – really quickly. The second book had 4 (I think) quilt samplers in it. I just started the first one. I figured that I’ve been lugging these books from apartment to apartment and then from house to house that I might as well as use it. I’m not totally in love with the quilt patterns anymore but I might as well learn from them. And that is what I did. I basically started machine piecing with this quilt top. It’s not yet quilted yet and I’m still debating whether I should add borders or not. Let me know what you think? To border or not to border. Updated on 8/25/13 – I decided to not add a border. I’m going to use this top as a way to learn to quilt and practice on a long arm. Updated on 9/2/13 – my September Get It Done Goals included getting this quilted on the long arm. I’ve never quilted on a long arm before and my LQS – the further one away – rents out their long arms. Since I battled quilting Kayla’s Thirties Quilt with my little Bernina I wanted to check out this process with Easy Street. It’s a pretty quilt but it’s big and I don’t want to use my little Bernina on it. But I also do not want to use that as my first quilt on a long arm. 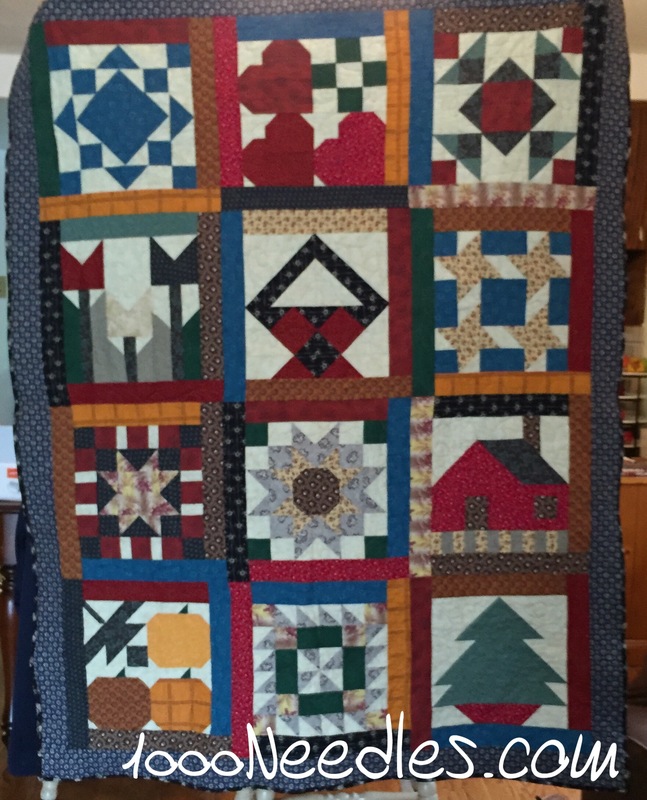 So this quilt – as it was my first practice quilt for machine piecing will be my practice quilt on a long arm. In order to rent out the long arm, I have to take a class to become certified to rent. I’m not available the next class date so the next one after that is Oct. 26. The weekend after PIQF. I’m not sure if I could swing doing Quilt stuff two weekends in a row. I do have to spend time with my family and work wise – October is one of the busiest months in the year. The next one after that is Nov. 2. So I’ve got 10/26 on my calendar as I’d rather get it done sooner. However I’m not going to register for the class until we get closer to then. I would say that I did as much as I could for this goal this month and push it off to October’s list. Updated on 10/13/13 – I’m moving this back down to UFO. I’m not doing any work on this one and with my secret project consuming me right now I’m not sure when I’ll get to it. Updated on 2/24/15 – I took this out of the UFO drawer and onto my design wall a week or so ago. The plan this year is to focus, concentrate on one thing at a time, and get things done. So after a few finishes this year, this came out. It wasn’t really next on my list but I bought a used mid arm from a fellow blogger and I wanted to try it out. I didn’t want to use it on the quilt that is ready to be quilted but to practice on something. Since this was my first quilt to learn machine piecing, it seemed appropriate to use it to practice quilting with the mid arm. 🙂 I felt I needed to add borders so I’m working on that now.